Gift certificates to use towards any Image Science products and services. 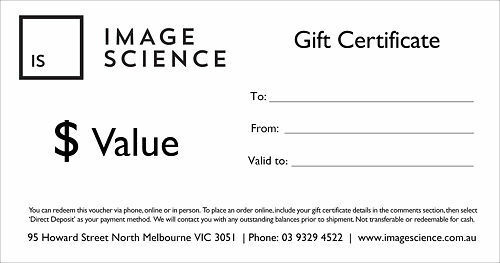 Image Science gift certificates allow the recipient to purchase any of our online products, as well as our printing and scanning services. Certificate does not need to be used all at once, with all remaining value credited to the customer for use in a further transaction. N.B. When ordering a gift certificate, please provide the recipient's name and email address in the order notes. Simply choose the desired dollar amount (add multiple products if you would like to get to a specific amount) and when we have received your order, we will send the certificate out via. Australia Post for FREE! Expect to receive the certificate in 1-3 business days. Should you have any questions, please contact us in regards. We will send out a single certificate for the amount you have chosen. Should you require the certificates to be individual (ie. 2 x $100, as opposed to 1 x $200 certificate) please leave a comment when you check out.